Cool Rocks. Bad Trail. Hoodlums’ Mission: Fix it. Hiking trails are like smart phone aps. Sometimes they need to be up-graded. Unlike phone aps, you can’t just punch up the ap store and push a button. Upgrading a hiking trail is hard work. Normal maintenance such as weeding, clearing blowdowns, and repairing check dams and water bars only maintains the status quo. Adding features takes it to a whole new level. This is the story behind a trail upgrade that changed everything. 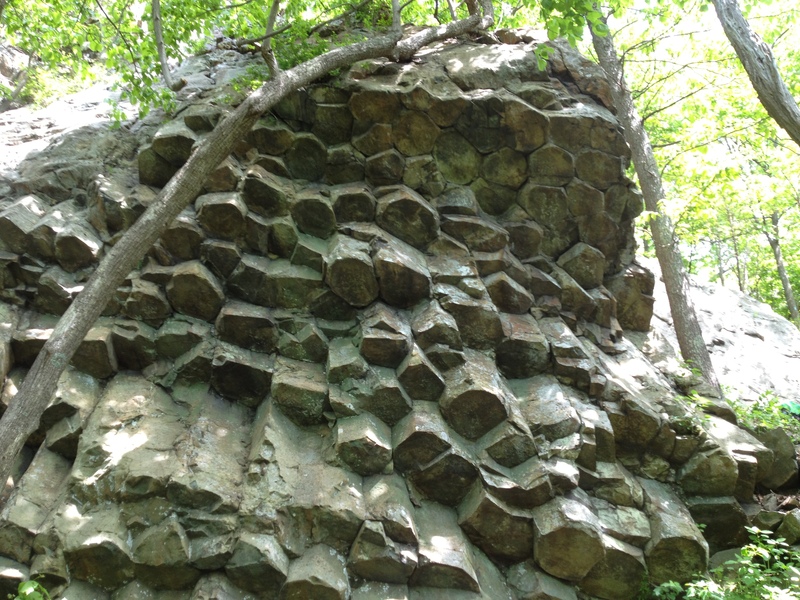 The Appalachian range is chock full of remarkable rock formations. Many of these iconic nature works are on the Appalachian Trail (AT) itself which has been purposefully routed so hikers can appreciate them. Others are nearby on side trails marked by blue blazes. One blue blaze you hardly notice passing by crosses the AT on Compton’s Peak in Shenandoah National Park (SNP). It leads to a delightful, and one of the more geologically interesting columnar basalt formations in the eastern U.S. It’s well worth a look. Compton Peak columnar basalt formation. Better yet, the trail intersection is about a mile south of the Compton Gap parking lot on Skyline Drive. It’s an easy approach hike to the top of Compton Peak. With the side trail, it’s a snappy 2.5 mile round trip. Wow! Let’s go. Not so fast. – literally. The blue blaze was not only steep, but was treacherous featuring spring-saturated mud-covered boulders and unstable talus on the final half. Not fun to hike and an easy way to turn an ankle or worse. That’s a problem. The solution: Send in the Hoodlums. By way of full disclosure, the Hoodlums aren’t criminals. This grubby group of trail maintainers just looks that way. In real life they’re educated professionals who love the AT, Shenandoah National Park. They volunteer their time, sweat and energy to protect and maintain them for everyone to enjoy. The moniker came by way of an unknown tourist in SNP. When she saw a gang of filthy, tired folks staggering out of the woods, she was overheard observing that they looked like a bunch of “hoodlums” to her, and a brand was born. Over three hard days last week, a Hoodlum crew of seven led by three National Park Service pros proved that rolling rock isn’t always a brand of beer as we pried, pushed, rolled, dragged, levered, and pounded chunks of basalt, some weighing hundreds of pounds, into 64 stone steps and hundreds of feet of rip rap. When we were done, the new trail was like a stone escalator down and back up. Thanks to National Park Service folks – Don, Eric and Lyndon, plus PATC Hoodlums – Wayne, Noel, Scott, Steve, Jim, Amy and Cindi – we got ‘er done in three days. We used the last day of our volunteer week to build stone erosion control structures further south on the AT. At the end we were an exhausted and bruised, but happy lot. As a bonus, I was able to meet some of the thru-hikers I’ve been following this year. Hike on folks, and have fun ya’ll. Meanwhile, we’ll keep improving the AT for those yet to come. ← No pain. No Maine. Insane!